WATERVILLE — Scott Kinney, 43, who has been logging the Maine woods since he was a teenager, remembers a particularly rough day after the ice storm of ’98. That day, he said, he was almost seriously injured several times by broken treetops, supported only by unstable tangles of limbs and poised to fall on the logger who was not quite quick enough to get out of the way. That day of dodging the treetops, called “widowmakers” in the logging industry, convinced Kinney that he and his brother Kevin had to find a better way to work the woods. Kinney had already suffered a significant injury while operating a chainsaw three years earlier, in 1995, when a moment of lost focus on a rainy day allowed a beech limb to spring up into his face, leaving a cut that required 34 stitches. “If we’re going to live very long in this industry, we need to go mechanized,” he remembers saying to his brother Kevin, 45, who also logs with him. Today, the Kinney brothers are one of the few logging operations in the area that use “cut-to-length” equipment, a method of processing the tree that is not only safer for loggers, but more environmentally friendly. 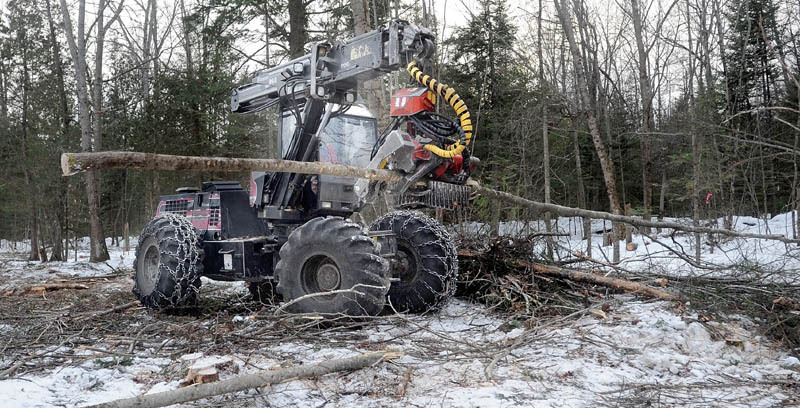 When a tree is felled by a cut-to-length harvester, it never touches the ground, John Williams, president of the Maine Pulp and Paper Association, said. Instead, the harvester grips the tree with a claw while it is cut. Then it lifts the tree straight up and processes it right there at the stump, shearing it of its limbs and cutting it to length before loading it directly onto a trailer. The process is also significantly easier on the environment, Williams said. Because trees aren’t falling, there’s less of a need to clear out neighboring trees, which allows the logger to be much more selective about which trees are actually cut down. The harvester is also able to work quickly and easily with the tops of the trees, which can be placed on the ground to create a road that softens the impact of the equipment on the ground below. The Kinneys are currently working a 20-acre woodlot behind the home of Michael Donihue, an economics professor at Colby College. Donihue said that he and his wife saw the Kinneys working on another property and were impressed with their philosophy of woodlot management. After asking around, he heard that the Kinneys “have a good reputation for working in environmentally sensitive areas in the Belgrade Lakes watershed,” Donihue said. Williams said most cut-to-length logging operations operate in the northern and western parts of the state, where larger tracts of land support the high cost of the equipment. In central Maine, he said, there are fewer operators, who tend to be in high demand from those who like the environmental advantages. The appeal of Kinney’s operation has allowed him to consider the long-term impact of taking on a new customer. He said he likes to have a conversation with the landowner in the beginning to make sure that the job can be done in a way that makes sense for both of them. For this reason, Kinney won’t clearcut land unless it’s to make room for a commercial development. He said that irresponsible land management can hurt a logging company’s reputation. “I have to think about what work I want in my portfolio,” he said. Kinney harvests from woodlots and commercial building sites within a 30-mile radius of his hometown of Belgrade. He sells logs, firewood, pulpwood and chips to customers including Verso Paper in Jay, Hammond Lumber Company in Belgrade, Sappi Fine Paper in Skowhegan, Tukey Brothers in North Belgrade, and area schools that use the woodchips to power biomass heating systems. In a conventional operation, dragging the cut trees along the ground can damage the earth and other trees in the area, resulting in a larger environmental footprint and also dirtying the wood. The cleanliness of the wood the Kinneys harvest is another advantage to the wood’s buyers, particularly those who burn wood chips to supply heat. The demand for clean woodchips that result from cut-to-length forestry seems to be growing — Colby College opened its biomass plant in January 2012. School districts based in Skowhegan and Oakland have also recently turned to biomass, partially because federal stimulus money to promote green energy eased the cost of the transition. “The schools aren’t set up to handle the dirt and mud,” said Kinney, who sells to Colby through Cousineau Forest Products. While the work is safer and more environmentally friendly, there are still surprises, he said. Kinney said he hopes to continue logging into his 60s.